This connected-home hub keeps all your data local and private, including the video from its onboard security camera. Stop me if you’ve heard this one before: There’s a new Internet of Things platform coming to market. Yeah, I know, everybody and their aunt, uncle, and third cousin twice removed has an Internet of Things platform these days. This one’s called Silk, and Sense—the first device to be based on it—looks very promising. It’s ostensibly a high-end home-security camera, but its capabilities go far beyond keeping an eye on the home front. To achieve that end, Silk Labs is outfitting the Sense with a high-resolution (1080p) camera and enough processor power (it’s based on a smartphone chipset) to recognize each person who enters a room and behave accordingly, turning on lights, adjusting the thermostat to your preferred temperature, and playing your favorite music. Fabricated from curved glass and a block of wood, the Sense is designed to blend into your décor instead of calling attention to itself. 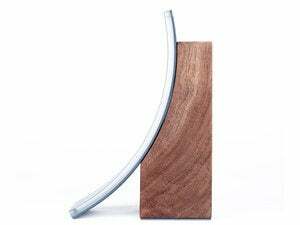 But the curve delivers function as well as form: The glass slides up and down along a track to adjust the camera’s vertical field of view (it delivers a 130-degree horizontal field of view). The Sense looks like no other connected-home device on the market. The Sense uses Bluetooth Low-Energy to exchange information with your smartphone. Tap your phone to the device and the phone will send your Wi-Fi network’s credentials to the Sense. The Sense, in turn, will send a cryptographic key to the phone. Only phones that have been physically paired in this way will be able to access data—including video—that’s stored in the Sense. No data is ever stored in the cloud, but smartphones with the key will be able to access a remote feed of live or recorded via the Internet (with end-to-end encryption). 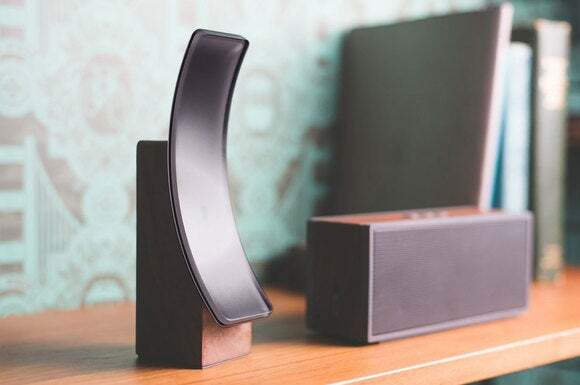 The Sense will use facial recognition and Bluetooth LE (for proximity) to identify who’s at home, and it will use voice and gesture recognition to enable you to interact with other smart devices in your home. Gal and his team demoed the Sense recognizing various team members as they stood in front of the camera, triggering lights to turn on in their preferred color and a Sonos speaker to play their favorite music. Gal said the Sense will learn and adapt to patterns over time to better suit your needs without the need for programming or complex macros. Silk Labs launched a Kickstarter campaign today to raise awareness and $100,000 for the project (the company has already raised $2.5 million in private seed capital). It hopes to bring the Sense to market by the end of 2016. Silk Labs is offering the Sense to early adopters at very attractive points during its crowdfunding campaign, ranging from $225 (limited quantity) to $249. “We’re basically selling the device at cost on Kickstarter,” Gal said last week. That’s because Silk Labs’ business model really isn’t about selling hardware, it’s about the software platform and licensing its technology to other developers. One of its early-bird specials includes early access to a free software development kit for creating other applications that will run on the Sense.